Sep. 23, 2016 11:00 a.m.
A double decker BC Transit bus in Victoria. TransLink will consider buying double-decker buses in the years ahead as it explores possible new vehicle types for its transit fleet. TransLink CEO Kevin Desmond says double deckers are run by BC Transit in Victoria as well as his former employer Sound Transit on intercity routes between Everett and Seattle, where they’re popular with passengers. Desmond said he believes they could have potential to add capacity in certain parts of Metro Vancouver, although they couldn’t run on routes with low obstructions. “They would not fit through the Massey Tunnel, for example,” Desmond said. Double deckers seat more passengers – 80-plus – but TransLink’s B-Line articulated buses have more overall capacity because of extra room for standing passengers. That would suggest they might be suitable on a route like the 555 bus that goes from Langley over the Port Mann Bridge. 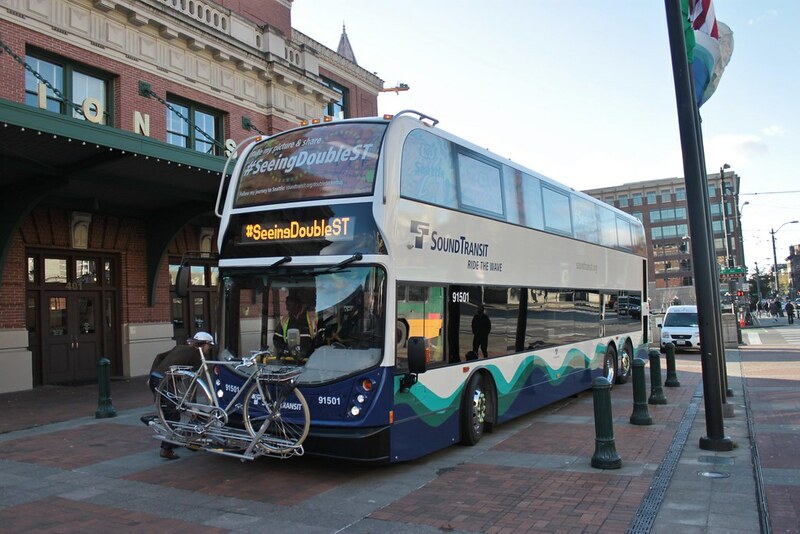 Double-decker bus run by Sound Transit in Seattle. Photo via seattletransitblog.com. Coast Mountain Bus Co. continually evaluates the future of its fleet and options like double deckers are worth considering, he added. All electric buses will also be evaluated, Desmond said, adding CMBC officials recently saw a demonstration electric double decker currently running in Victoria.